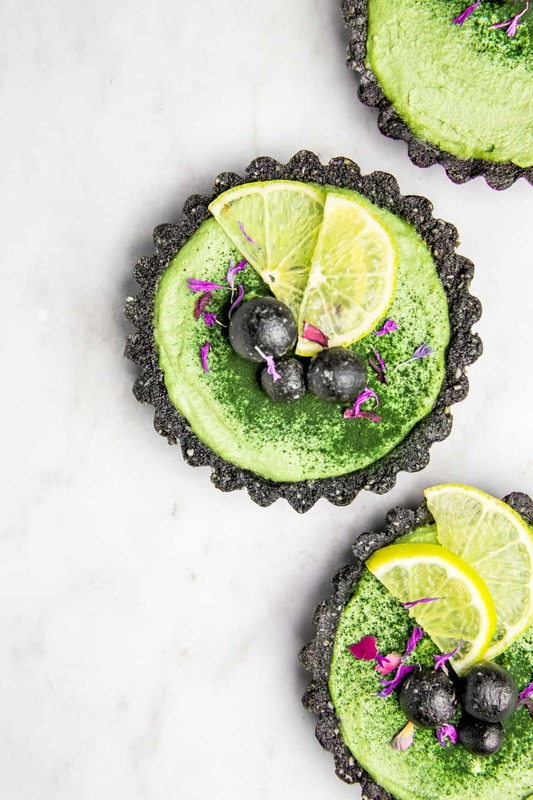 These pretty coconut lime & avocado pies are the perfect recipe be it for a fancy dessert or your daily mid-afternoon snack. Low in sugar, packed with nutritious ingredients and superfoods, they are also a nice healthy alternative to regular sweet desserts. Behind their stylish look they are ridiculously easy to prepare and require only a few ingredients. And if you don’t believe me, just watch the step by step video below that will show you how to make these delicious and creamy pies in no time. YEAH ! I’m so happy to finally show you my very first recipe video ! It’s something I had in mind for a long time but simply never took the time to go for it. But when I made these raw mini pies, I knew this was THE recipe made for it. What I love with recipe videos is how they can demystify a recipe and inspire people to make it at home. When you see the final look of these pies, you should think they are super tricky to make and require technique. But when you finally watch the video, you realize how super easy they are ! All you need is a blender and / or a food processor, a few ingredients you probably already have in your cupboards, and a couple friends to share. I made this recipe on the occasion of a workshop in Copenhagen. 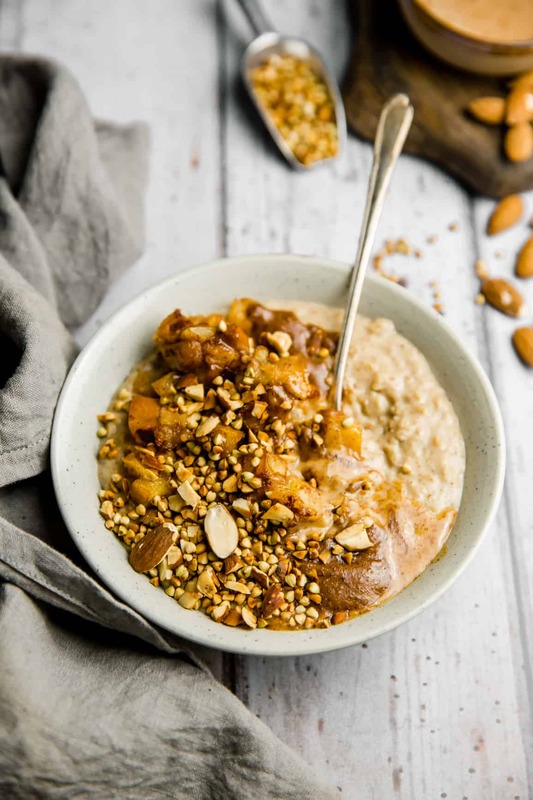 I had to propose a recipe to the participants and I though this one was perfect because it is a big classic of plant-based food, and the occasion to use a blender and share many interesting cooking tips about the ingredients, the textures and the process. Also I personally love raw cakes because they are very simple to make, doesn’t require that much equipment and baking time and are so versatile. My favorite part is the decoration : during the workshop we asked to the participants to get creative and use all the ingredients of their choice to garnish their pie. And at the end, everybody had something totally different, something that reflects their own personality. Because I think there is always a small part of creativity and art in cooking, by the flavors, colors and texture you choose do use. Well, back to these mini pies! Not only they look pretty, they are really delicious! The combination coconut and lime is a classic combo that never fails and one of my favorite one. Coconut gives this rich and generous flavor and the lime brings a fresh touch to the final product. Even if they are refined-sugar free, these pies are nicely sweet thanks to the dattes and agave syrup. But if you prefer you can absolutely go for a totally sugar-free version by omitting the agave in the filling! For the filling, I used half soaked cashew and half avocado flesh for the creamiest result. It’s so smooth that I could eat it on its own by spoon. 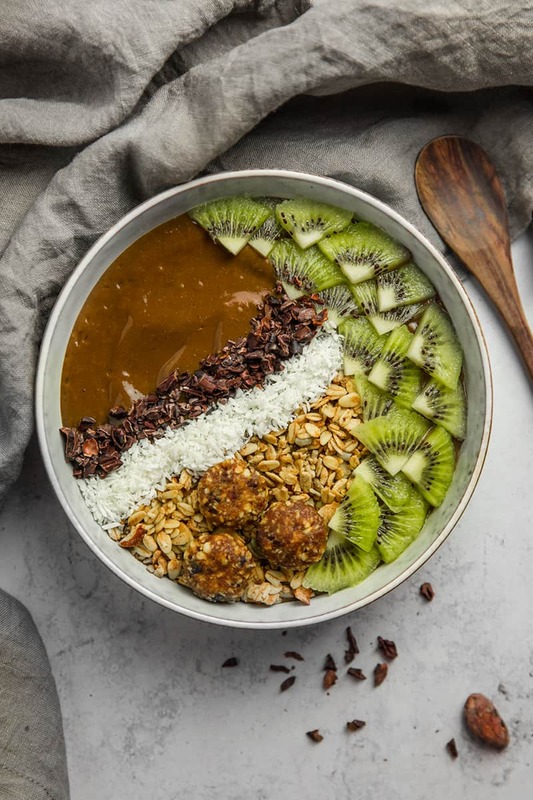 I never use only cashew in my raw desserts because I think cashew are really nourishing and also pretty expensive. I used to cut half of the cashew with coconut cream, banana, fruits or avocados. Using very ripe avocado is a must to make the texture even more creamier. Also avocado is the best option for these pies as the flavor perfectly pairs with coconut and lime. 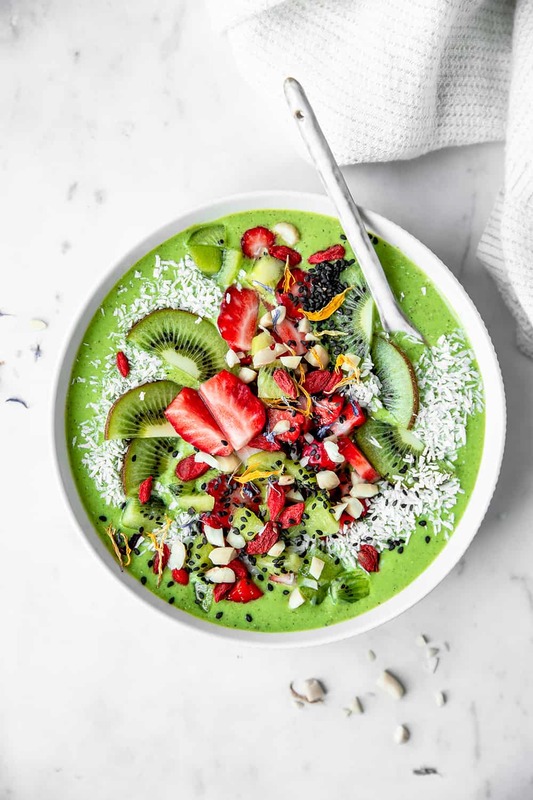 To intensify the beautiful green color of the cream and for an extra superfood, you can add some spirulina powder in the mixture. Spirulina is a green vegetable plankton that grows in the fresh water in China and Canada. Spirulina is considered as one of the most nutritious food sources known as it contains huge amounts of chlorophyll that provides proteins, increases energy, attention, focus and mental clarity. Spirulina is one of my favorite superfood, super easy to use in your smoothies, juices, dessert, salads and even savory preparations. However be careful when you add the spirulina as it is very powerful and can very quickly change the color of the cream to a dark green! Start with a pinch and add more if necessary, until you reach the desired color. Like with all the superfood, be conservative, a small amount goes a long way. I’m so obsessed with these pies and how easy they are, that I made them three times in different versions! What is really fun with this kind of recipes is that you can create something totally different by simply changing one or two ingredients. For instance, substitute the spirulina for cacao powder and lime for vanilla and you have a delicious creamy chocolate mousse pie! Be creative! Play with he ingredients and flavors to create a recipe that looks like you. When using good ingredients, you can never go wrong! 1. Prepare the molds : line the mini pie molds with plastic wrapping and set aside. 2. Add the almonds to the food processor and pulse to break down in small chunks. Add the shredded coconut and salt, process to combine and until everything is well broken down with small chunks remaining. 3. Stone and roughly chop the dates. Add them to the food processor with vanilla extract and charcoal powder and process until the crust starts to rise on the sides of the food processor bowl. Stop the food processor, scratch the sides of the bowl and mix with a spatula. Repeat a few times until a consistent and evenly black paste forms : the final result of the crust should be a dense shapable mixture that holds together and is not too sticky. 4. Remove the mixture from the food processor bowl and divide into 4 even balls. Distribute each ball evenly on the bottom and sides of the the molds and gently compact by hand. Use your fingers to evenly smooth the surface of the bottom and well press the crust on the sides of the mold. Keep any crust mixture leftovers to shape small balls for decorations. Place the crusts in freezer while you prepare the filling. 1. Rinse and drain the soaked cashews and add to a blender with the flesh from the avocados. Blend until perfectly smooth and creamy. It can take up to 5 minutes to reach this consistency. If necessary, stop the blender and scratch the sides of the bowl to retrieve all the mixture. 2. Add the agave syrup, lime juice, lime zest and spirulina and blend to combine. Add the melted coconut oil and briefly blend high speed until well incorporated. 3. Remove the molds with prepared crust from the freezer and pour in the filling mixture. Fill to the brim and smooth the surface with the back of a spoon. Place in freezer to firm for at least 2 hours, or more if necessary. 1. Once the pies have firmed, remove from the freezer. Gently remove the pies from the molds by pulling on the plastic wrapping, being careful not to damage the pies. Place the pies onto a serving plate. 2. 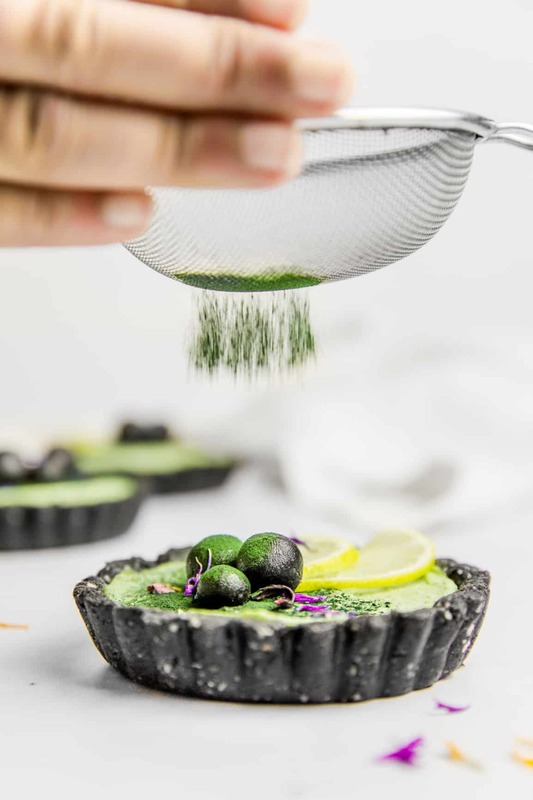 Sprinkle some spirulina powder on top using a strain mesh, and decorate with the balls made of the crust mixture, thin lime slices and edible flowers. 3. Serve immediately. These pies are better consumed the same day but will keep for up to three days, covered in the fridge. Because of the oxydation of the avocado, their color can change and slightly turn to brown. This should not alter the taste and quality of the pies. 1. Préparer les moules : chemiser les moules à tartelette de film plastique afin de faciliter le démoulage, et réserver. 2. Placer les amandes dans le bol d’un mixeur et mixer afin de les réduire en petits morceaux. Ajouter la noix de coco râpée et le sel et mixer de nouveau jusqu’à obtenir une poudre de la taille de grains de sable, sans gros morceaux. 3. Dénoyauter les dattes et les gâcher grossièrement. Ajouter les dattes dans le mixeur, ainsi que la vanille et le charbon en poudre (optionnel) et mixer jusqu’à ce qu’une pâte se forme. Si la pâte s’accumule sur les bords rendant le mélange difficile, ne pas hésiter à éteindre le mixeur et à grater les bords du bol à l’aide d’une spatule pour ramener toute la matière vers les lames avant de mixer de nouveau. Répéter autant de fois que nécessaire. A ce stade, vous devriez obtenir une pâte ferme, malleable et pas trop collante. 4. Retirer la pâte du mixeur et la diviser en 4 petites boules de taille égale. Placer chaque boule de pâte dans un moule à tartelette chemisé et l’appuyer dans le fond et sur les bords du moule avec les doigts pour former une croute bien lisse et régulière. Garder d’éventuels restes de pâte pour former de petites boules qui serviront en décoration des tartelettes. Placer les moules au congélateur pendant la préparation de la garniture. 1. Rincer et égoutter les noix de cajou préalablement trempées. Les placer dans un blender avec la chair d’avocat et mixer jusqu’à obtenir une préparation parfaitement lisse et crémeuse. Cela peut prendre quelques minutes pour obtenir la texture désirée. Là encore, si le blender tourne dans le vide, ne pas hésiter à stopper le blender et racler les bords du bol pour récupérer la matière. 2. Ajouter le sirop d’agave, le jus de citron vert, le zest de citron vert et la spiruline et mixer de nouveau. Finalement, ajouter l’huile de coco fondue et mixer brièvement pour mélanger. 3. Retirer les moules du congélateur et verser la préparation. Remplir jusqu’au sommet et bien répartir à l’aide d’une spatule ou le dos d’une cuillère pour avoir une surface lisse. Remettre au congélateur pour au moins 2 heures, ou jusqu’à ce que les tartelettes se soient bien raffermies. 1. Une fois que les tartelettes ont bien durci, retirer les moules du congélateur et démouler le tartelettes en tirant doucement sur le film plastique en faisant attention de ne pas les abimer. Placer les tartelette sur un plat à service. 2. Parsemer délicatement de spiruline en poudre à l’aide d’une passoire fine et décorer avec des tranches de citron vert, des fleurs et d’éventuelles boulettes de pâte restante. 3. 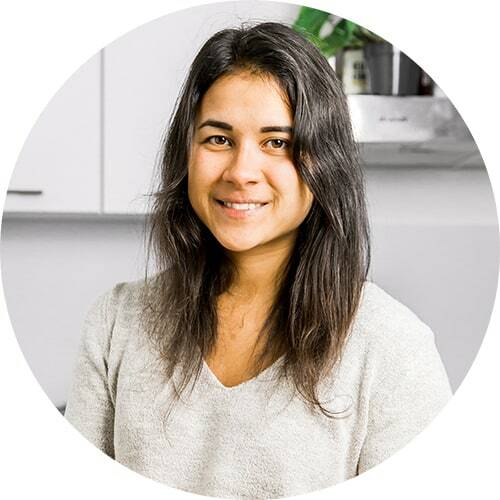 Servir immédiatement ou garder au réfrigérateur. Les tartelettes sont meilleures consommées le jour même mais peuvent se garder au réfrigérateur dans un récipient hermétique pendant 2 à 3 jours. A cause de l’oxydation de la chair d’avocat, leur couleur peut varier et noircir, ce qui ne devrait pas altérer leur qualité.